Sending positive thoughts to you and Honey! Thank you for the replies everyone. I woke up just now and went to check in on Honey. He is breathing through his mouth ocassionally. He’s eating his pellets right now. My mom told me that he was playing prior to eating. Things are looking good. I’ll be taking him to the vet in an hour now. 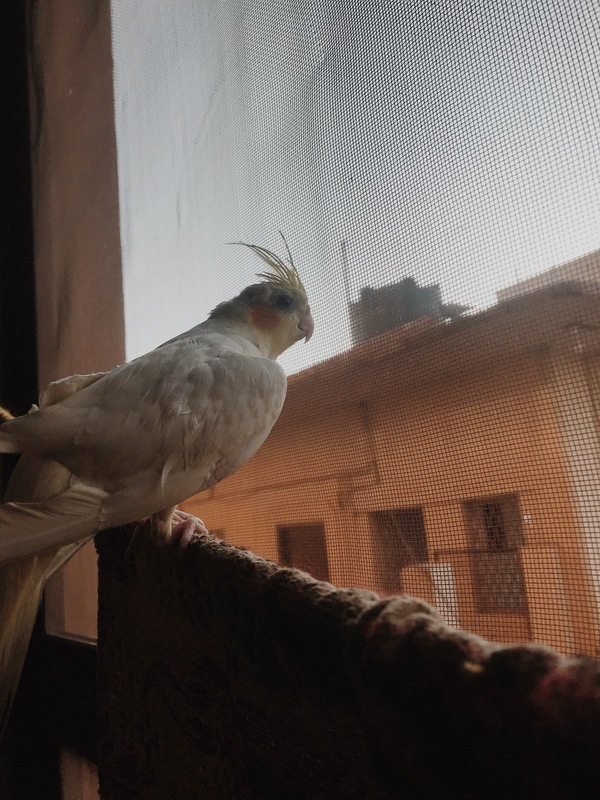 I wanted to ask something first - Yesterday, when he started choking, he lost a feather immediately. Is this normal? 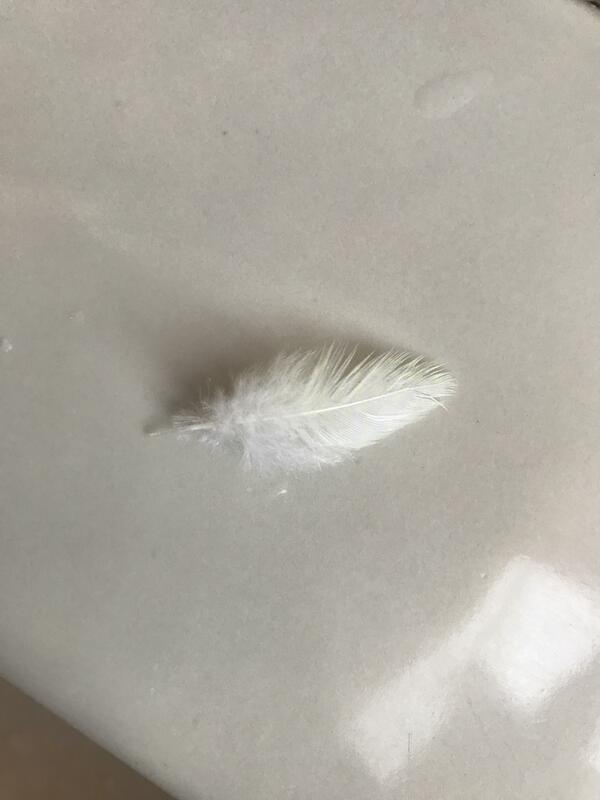 This morning as well, I found another feather at the bottom of the cage. Is this because he’s sick? His tail is still bobbing. This is from today. Yesterday’s feather was much bigger. The feathers probably got a good jostling from the last visit so a few may have come loose. Sending positive energy your way for a good outcome today! My cockatiel had kind of a mini-molt immediately after getting toweled to have her nails done. It is possible that being restrained knocks a few loose. Screamer grew some new ones and all was well, but I was a bit surprised that she dropped so many after being toweled. The Vet was in for a surgery so I didn’t get to meet him but we talked over the phone. Since Honey is not breathing from his mouth anymore, he said that he’d skip the injection (this helps to pass urine and clear fluid from lungs) and just gave him nebulisation. So we did that and left. I have to check in the evening with the doc again to give him an update on Honey. Based on how he is doing, the vet will decide what to do next; whether or not to give an injection or not. Honey is doing much better. A bit cranky but still back to his old self for most of the part. He’s usually so hyperactive and playful and seeing him yesterday so weak and gasping for air broke my heart. I never want to go through this again. I’m still worried about any fluid that may still be in his lungs....I think most of it got out but I’m skeptical if all of it did. How can I be sure if his lungs are clear? Thank you all for your support. You have no idea how much it means to me. Last edited by reeisconfused; 01-21-2019 at 03:41 AM. Thanks for update, glad things are getting better!!! Yes following and thankful things seem to be looking better. I was really tired and then really busy so couldn’t update you all. Honey is doing much much better! No more mouth breathing and back to his self. He was very irritated last night after his vet visit and was lashing at everyone who came near his cage. He was growling and lashing at his own toys. I think the rough handling at the vet got to him a bit but he was back to normal this morning. He was a lot more vocal today during the ride to the visit. The doc checked him up and gave him a clean bill of heath! Yay!!! He also flushed Honey’s nostril so we’re all good now! I am so relieved. The past three days have felt like WEEKS. I am so so grateful that I found an avian vet here, without whom Honey would never have made it. Here’s a photo of Honey sight seeing at the balcony today after his visit to the vet.